The Very Reverend Canon John Joseph Flattery went to the Lord on Thursday, January 17, 2019 at his home. He was born June 4, 1930 in Danville, IL the son of John and Hildegarde Faulstich Flattery. They proceeded him in death. Visitation will be held at Holy Family Church, 444 E. Main Street, Danville on Friday January 25, 2019 from 4 to 7 p.m. with a rosary at 3:30 p.m. Funeral Mass will be held at 10:00 a.m. on Saturday, January 26th. Internment at Resurrection Cemetery with Military rites by American Legion Post 210. Rev. Canon Flattery had attended St. Joseph grade school in Danville. After eighth grade graduation, in 1943, he entered the classical prep school at the Pontifical College, Josephinum, Worhington, Ohio. He graduated High School in 1947. He received his Bachelor’s degree in Philosophy and Humanities there in 1951. He received his teaching certificate from Illinois State University. He was ordained a priest for the Diocese of Peoria, IL, June 4, 1955. From 1956 to 1960, he taught History, Social Science, Latin, and Greek at Marquette High School, Ottawa, Il. He entered the United States Air Force Chaplaincy in August 1960 (Presidential Commission). He has been a member of the USAF Chaplain Board and served in the Office of the Command Chaplain, Headquarters Air Training Command, twice as Chief of Professional Division and as assistant command chaplain. He was Installation Chaplain at Sidi Slimance AS, Morocco; Shu Linko AS, Republic of China; TUSLOG, Detachment 118, Ismar, Turkey, and Incirlik AB, Turkey; Clark AB, Republic of the Philippines; Carswell AFB, TX and Davis-Monthan AFB, AZ. Other assignments include Robins, AFB, GA; Myrtle Beach AFB, SC; and Chanute AFB, Rantoul, IL. He earned two Master Degrees; one in Educational Psychology from the University of Illinois (1970) and another in Divinity from the Pontificial College Josephinum (1974). In January 1975, he received a Doctorate in Education from Boston University. 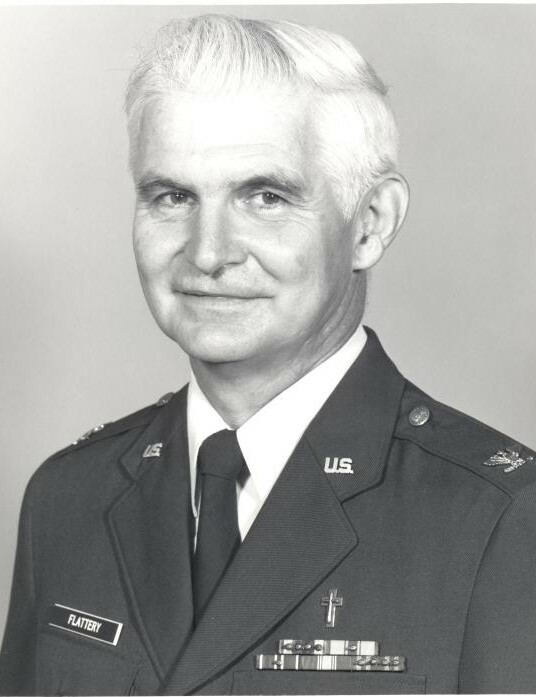 After completion of his doctoral studies at Boston University he was assigned to the USAF Chaplain Board at Air University. He did extensive studies and evaluations on religious education materials. He then was able to publish two editions of the “Catholic Curriculum and Resource Guide” for use by chaplains in their field of religious education programs. Several other publications followed and were used for people entering the Air Force to help them reflect on values and goals in life. On August 15, 1971, Chaplain Flattery was appointed a Very Reverend Canon in perpetuum of the Cathedral of St. John the Apostle and Evangelist in Izmir Turkey by the Most Reverend John B. Boccella, Archbishop of Izmir. Chaplain Flattery received the Air Force Meritorious Service Medal with seven Oak Leaf Clusters and the Air Force Commendation Medal with one Oak Leaf Cluster. He retired with the prestigious title of Colonel in 1988. After his retirement from the Air Force in 1988, he had joined the staff at St. Leo College in Florida when he received a call from Bishop John J. Myers asking him to return to the Peoria Diocese and assume duties as Pastor of Holy Family Parish in Danville, his home town. Canon Flattery was pastor and vicar of the Danville Vicariate at Holy Family from 1990 to 1992. He was then called to be pastor at St. Matthew Church in Champaign, IL from 1992 to 1994. He received Senior status in June 1995 and retired a second time. He has assisted area pastors on a regular basis and has been active in the community. He had been called upon to give lectures and talks to various community groups both here and in Champaign. He was very enthusiastic about education especially history and the preservation of history. After retirement he did extensive research on the histories of the Danville Catholic churches. He published two books; “Our Holy Family” which traces the history of both St. Patrick’s Church and St. Joseph Church and their merger to form Holy Family Parish and “Our Holy Family: It’s Sacred Art” which traces the history of the stain glass windows now placed in Holy Family Church. Memorials in his honor can be made to Holy Family Church, the Danville Library Foundation or the Vermilion County Museum. Messages and memories may be left on our website at www.KrugerCoanPape.com, or on the Kruger-Coan-Pape Funeral Home Facebook page.